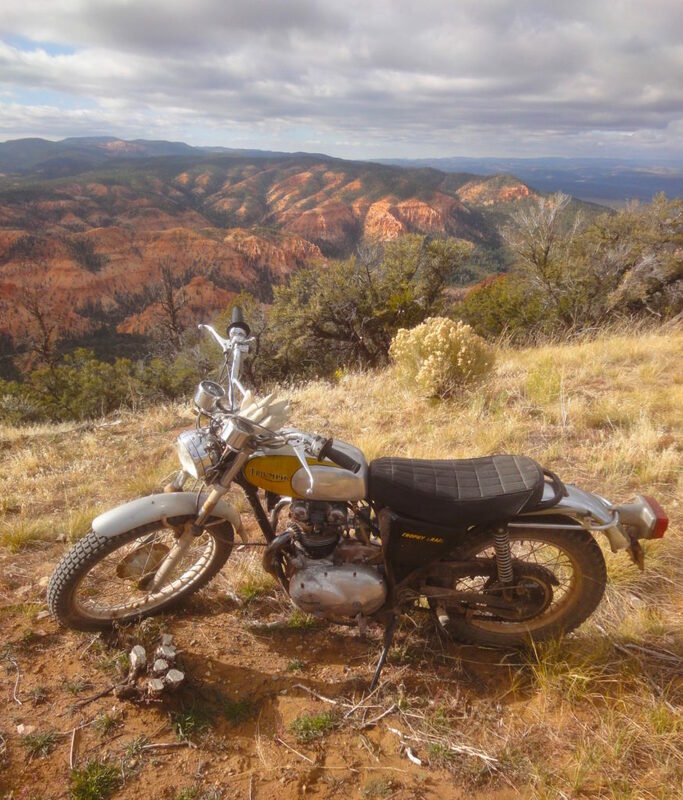 It sounds like the start of a good yarn; two friends haul their crappy old Triumphs to southern Utah for some canyon-hopping. While it turned out to be a very good boys-on-Triumphs story, it had an inauspicious beginning. I’d only ridden my 1973 Triumph TR5T ‘Adventurer’ on paved roads, and don’t consider myself an off-road expert. 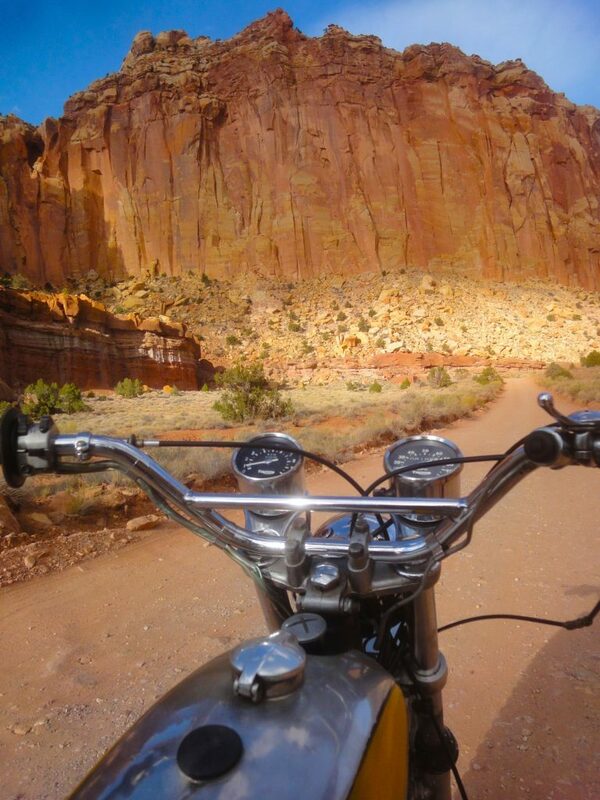 But the canyonlands of Southern Utah are my favorite places to ride, being geologically unique and breath-takingly beautiful. I’d long yearned to explore the region’s secrets away from the highways, poking into the canyons on the dirt roads tantalizing my curiosity on every map. My pal Conrad, a native of Canterbury, England, had a similarly limited off-road resumé, and had recently emigrated to the USA. 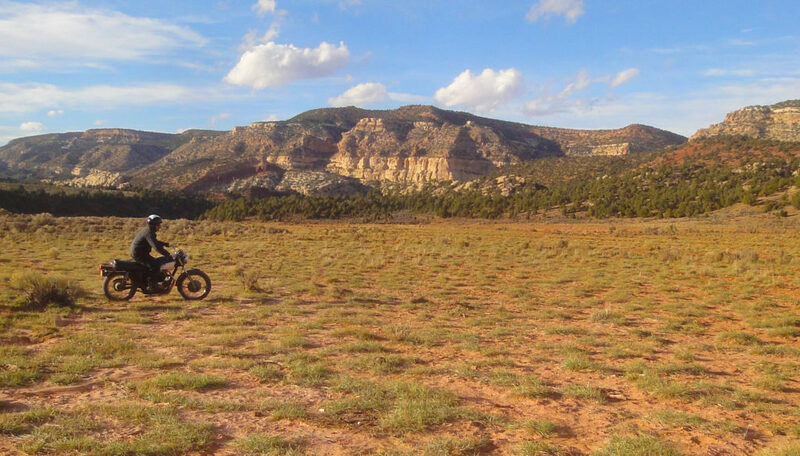 To a newly arrived Brit, the lure of Southwest canyons was irresistible, so we hatched a plan to take the only dirt bikes we had – vintage Triumphs – to Utah. 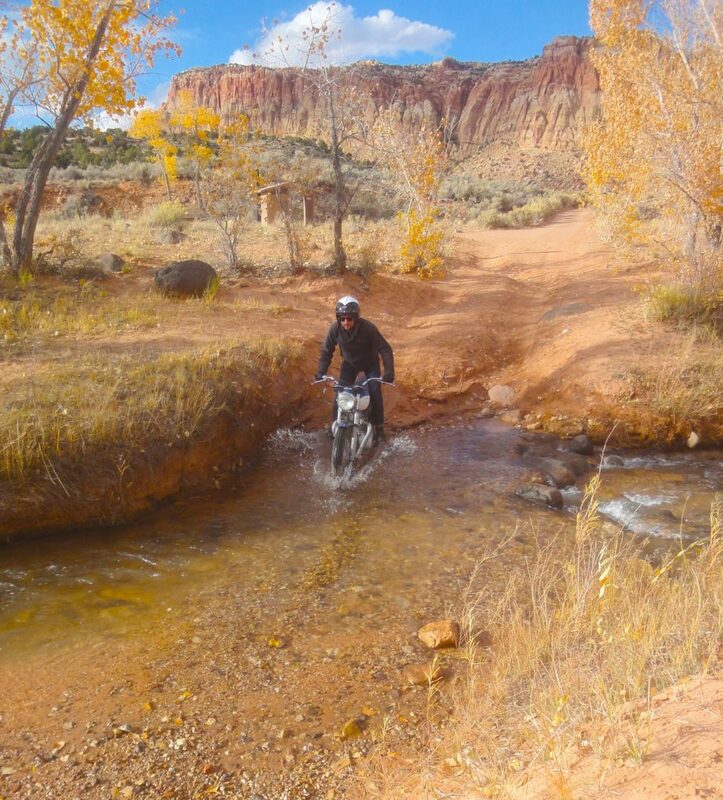 Conrad Leach fording the Fremont River in Capitol Reef National Park, on his ’71 Triumph hybrid. Well, Conrad didn’t actually have a Triumph to hand. Earnest searching on Craigslist revealed a 1971 Triumph TR6R 3 hours away in Sonora, for only $1300, so the first part of our adventure was driving to the Foothills to meet Jeff Epps. Jeff turned out to be a true mountain man, living in a remote cabin he built himself, and in the manner of all owner-built domiciles, the shack was unfinished. 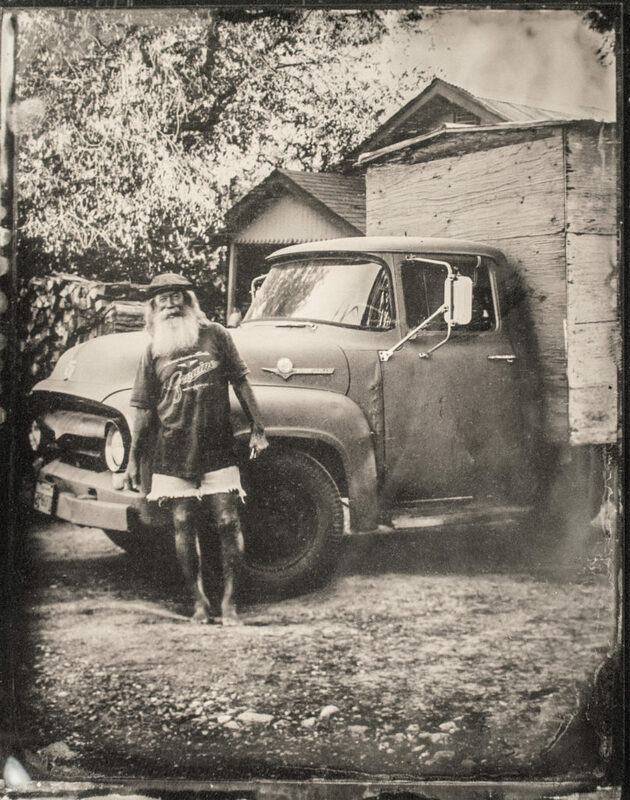 The imposing 1953 Ford F150 truck with tiny cabin on its flatbed gave a clue to Jeff’s relaxed building pace – he had a truly mobile home on site. The TR6 for sale stood next to a nice BSA B50, and looked good, although it was understood to need work, and was cheap, so we did the deal. Unfortunately, looking good and actually being good are very different; the Bonneville engine was knackered, and our Utah dreams faded. Fortunately, we found another motor in San Francisco, powering a fairly awful bob-job. 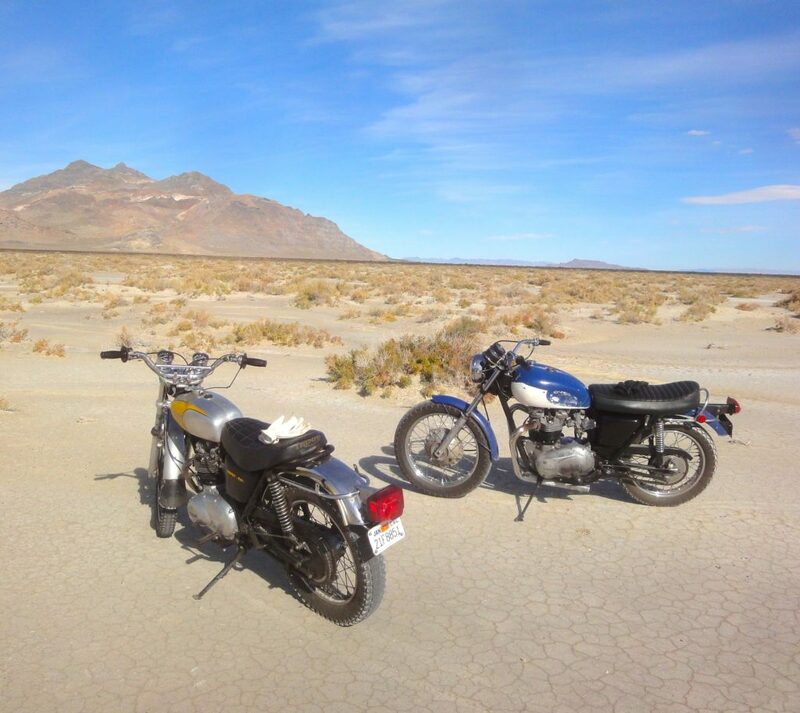 Suddenly Conrad was 2 bikes deep, so we swapped their motors, and voila, a week later we were ready to roll with his ’69/’71 desert sled. It’s a 14-hour drive to Torrey Utah from San Francisco, and with no real timeline, we explored whatever looked interesting en route. While crossing Donner Pass (7200’), we spotted a perfect road winding up from Donner Lake, lined with yellow Aspen leaves in a solid granite landscape. We had to try that road, and test our bikes at altitude – the road was gorgeous, and the bikes ran perfectly, which seemed a good omen. 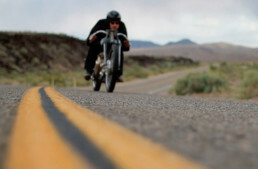 Conrad Leach twisting the throttle at the Bonneville Salt Flats. The salt was much smoother in 2011 than today, and in some areas it’s only an inch thick, imperiling the future of Land Speed Racing. 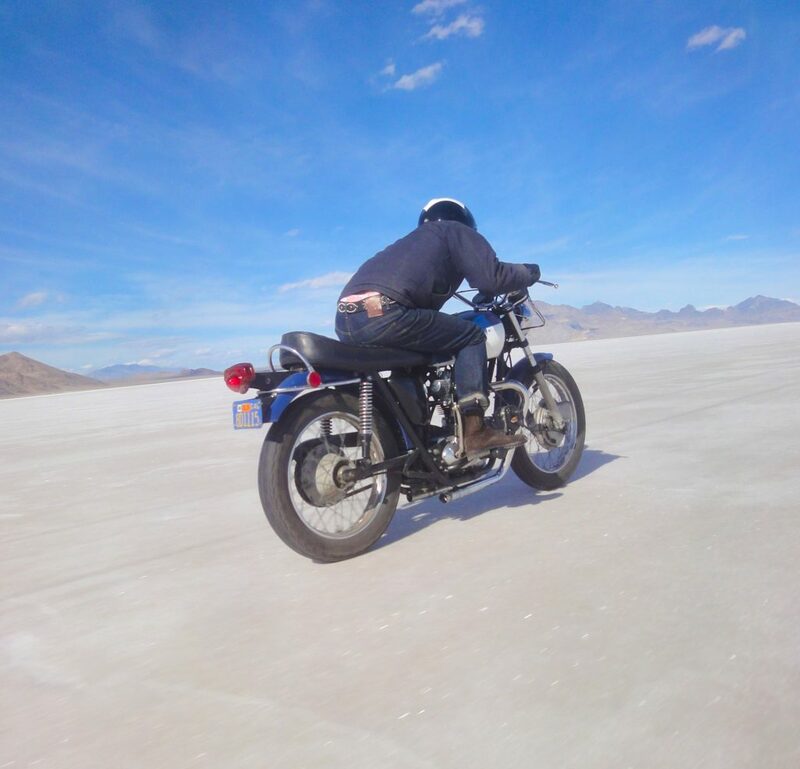 Our next stop was the Bonneville Salt Flats, where nothing happens in mid-October; Speed Week is long over and the place is deserted, but if you like solitude, and to ride any speed in any direction for as long as you like, there’s no place like it. We did all that, and explored the borders of the lake too, which takes a surprisingly long time to reach. There’s no gauging distance with no features in the middle ground, and the lake ranges from 20-40 miles wide at spots. We were tempted to head up the dirt trails in the bordering mountains, as we’d heard there are caves with petroglyphs in the area, and evidence of human habitation 10,000 years ago, when Lake Bonneville was a hundred feet deep, and enormous. 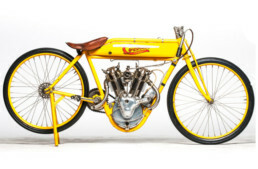 Springville, Utah, is 5 hours from Bonneville, and the site of Jeff Decker’s Hippodrome Studio, with his Crocker and Harley-Davidson racers, Miller track car, and collection of Biker memorabilia. 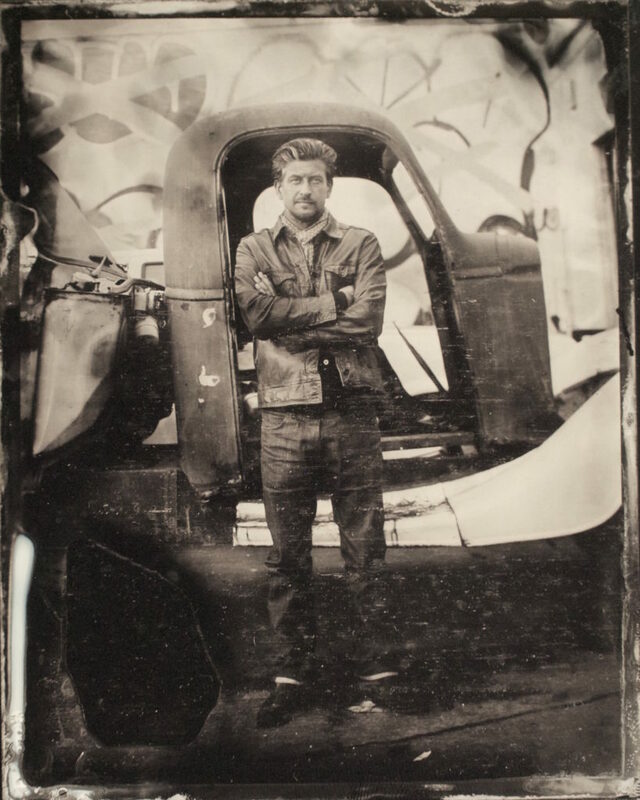 Jeff was inspired to shoot Wet Plates in the old ghost town of Eureka, so we headed into the desert, where Google Maps instructed us to a dirt road shortcut to Eureka. We bumped over a deteriorating, shrinking, rutted cow trail with deep ravines and dry stream beds, until we got stuck. 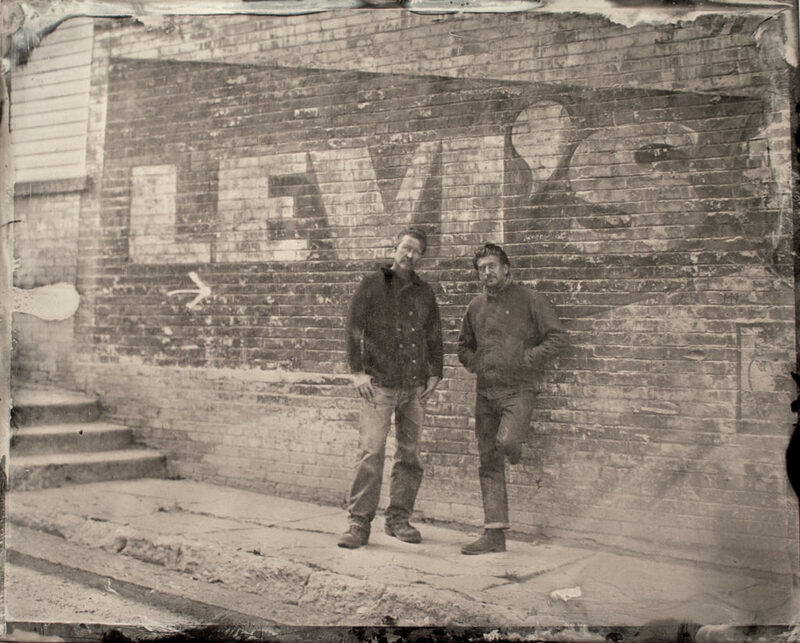 Then 3 city boys in our ‘workwear’ dug big rocks out of the dirt with our bare hands, jacked up the truck, and made a path out with sticks and stones…we survived to shoot photos at Eureka. A chain of National Parks is strung between Nevada and Colorado, a continuum of canyons between Zion National Park near the Nevada border, thenBryce Canyon,Escalante, Capitol Reef, Canyonlands, and finally Moab near the Colorado border. My favorite is the least-touristed; Capitol Reef National Park, with large swaths of brilliantly-colored cliff faces (‘reefs’) lining the highway, white Navajo sandstone domes (‘capitols’) towering overhead, an old Mormon settlement with a still-vibrant fruit orchard, and a lot of dirt roads crossing its mesas and sand washes. We stayed just outside the park entrance, in Torrey, and asked a ranger for a good day-ride dirt loop; she suggested Pleasant Creek/South Draw Road, “a really good 4WD road” that began at 6000′, followed Pleasant Creek to its source, and would loop us back to Torrey in about 80 miles. Always listen to the locals; South Draw Road is a challenging mix of stream crossings, soft red powder, deep rock-lined gulleys, and steep climbs up rock staircases. It also threads several red-rock canyons, follows a beautiful stream to its 9500′ high source, and traverses grassy high-altitude meadows that beckon a traveler to stop and look. 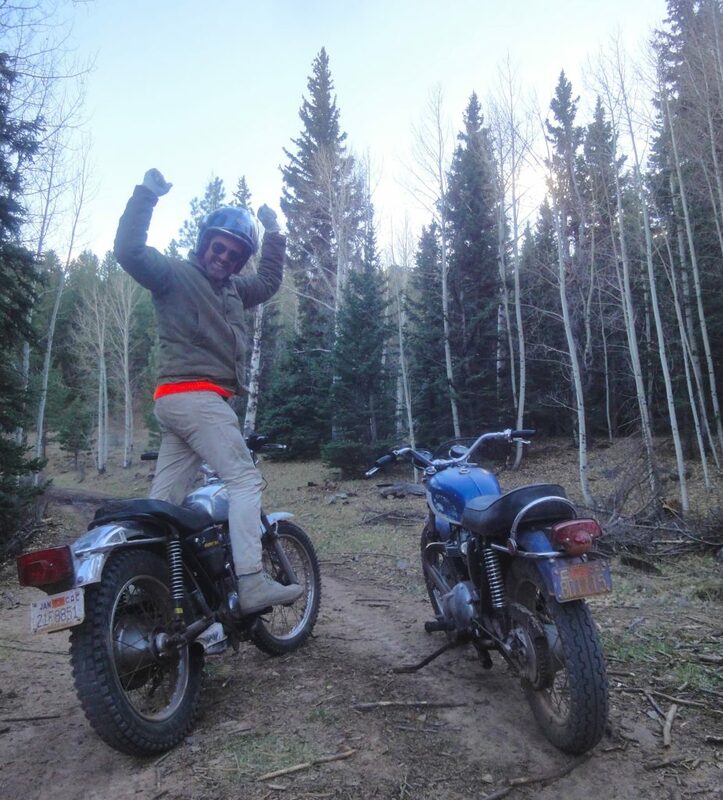 It took all of our motorcycling experience to navigate the treacherous path without coming to grief, or damaging our road-going 1970’s Triumphs. We passed exactly one vehicle in 80 miles; a Jeep struggling up a steep Devil’s staircase of flat sandstone slabs, which was strewn with loose square boulders. We asked if we could help, but they demurred, and we carried on, arriving at a grassy mesa surrounded by spectacular cliffs. If we had tents, we would have slept in this beautiful place, but we had 40 more miles to go, it was already mid-afternoon, and we didn’t like the idea of dirt-riding by 6 volt headlamps. We were sometimes blinded by the low sun, and rode with one hand shielding our eyes, the other twisting the throttle and guiding our wheels through dirt gulleys separated by grass hillocks. By the time we left the red rocks and entered an Aspen forest, we’d climbed to over 10,000’, and soon joined little Hwy 12 at its summit, which already had snow in its hollows. It was cold at the 10,000′ summit of Hwy 12, so we rode directly, dirty and bike-rough, to the best restaurant in town, drank several margaritas each, and had a terrific dinner. We rode home by full moon and our pilot lights, as the serious pounding had broken both our main headlamp bulbs. In the moonlight we saw the shadows of deer running beside us, and were beat but elated at a memorable day’s ride. The next day we found Goosenecks Overlook, just outside Capitol Reef Park, a dirt road leading to a loose red shale landscape, and the fierce 600’ drop into Sulphur River canyon. Needless to say, the photos were dramatic, although the cliff’s edge gave Conrad the heebie-jeebies, which meant only my TR5T made it to the edge of the cliff! 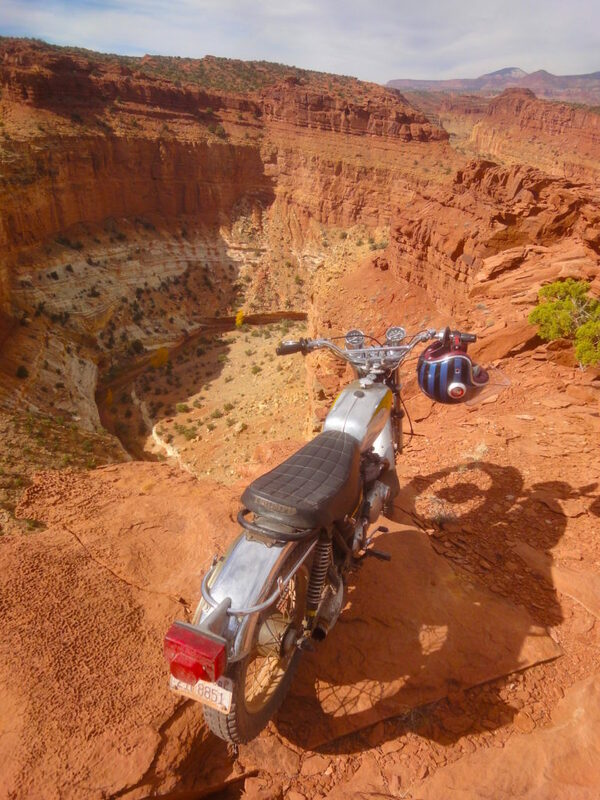 The cliff’s-edge photos make a compelling argument for 45-year old motorcycles; they’re still competent in rough terrain, they’re cheap and fun and easy to keep working, and provide a high ratio of smiles/mile. Why oh why don’t more people take their old bikes on adventures? The goosenecks at Sulphur River Canyon, after a red-shale ride with no trail. Spectacular, no? After the Goosenecks. we headed further outside Torrey to the Great Western Trail, which spurs off Hwy 24 due East into the mountains, and seems to have no end at all. It seemed, looking at the maps, that one could ride for days or weeks exploring the area in a single thread, camping in the vast wilderness stretching clear into Mexico, and beyond the border even, if one had the gumption and an idea of supplies. There are hundreds of dirt roads winding through the mountains and canyons of the Southwest, on their way to God knows where, or whose property or reservation, which is exactly their allure. One day, we told ourselves, one day. The next day we drove to Bryce Canyon National Park, just ahead of the snows that reached Capitol Reef that day. Bryce Canyon itself is a weird pink wonderland, and while there are no roads inside their colorful hoodoo wonderland, there are plenty of dirt roads just outside the Park. We chose a road through Coyote mesa, where Conrad discovered that old Dunlop TT100 tires are really slippery over sandy roads, by launching himself sideways over a banked dirt corner. 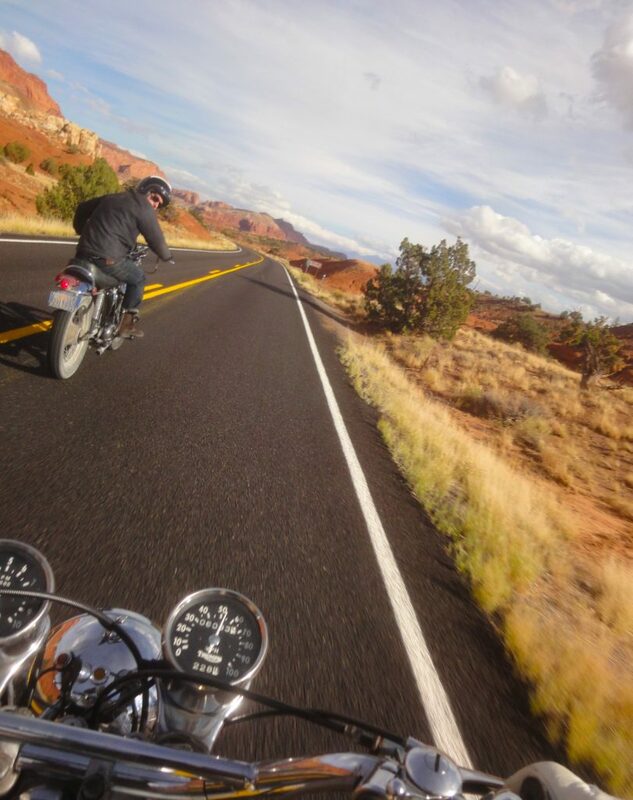 Remarkably, he didn’t crash, and we carried on exploring the best Utah had to offer. In our 4 days of intense off-road riding, nothing broke – not us or the bikes, which wore a caked mix of salt, red dirt, and sand. We power-washed every crevice of our Triumphs just before leaving Utah on our 2-day drive back to California, tired and happy, ready to do it all over again. Thank you – thank you – for owning a vintage bike that you actually ride the way it was meant to be ridden. I love that that is one of the main thrusts of this blog – vintage bikes are beautiful and should be ridden. Nothing pains me more than seeing an amazing old bike that just sits and looks pretty. Bravo! Great little adventure. I have been thinking of taking my V-strom to Utah and i think your pictures just closed the deal. As for vintage, I do have a CB 350 that would probably serve if I can find some high CL pipes for it. Conrad’s back tire looks to be identical to the Duro’s which I put on it this summer. Just to be safe. I won’t praise it at all. Inspirational! Thank you. I’ve also spent many happy days blasting across fire roads and power line roads in the Mojave on my 1970 Triumph 500 Daytona street bike. With a sleeping bag and some tools stuffed into a milk crate tied to the seat I’d spend the night under the stars — great stuff. The 500 is probably better for this sort of thing than the heavier 650. Even with street tires the 500 power slides like a true dirt tracker! As you noted, there are endless miles of dirt roads out there to be explored.